Now, right off the bat, I’ll tell you these are more expensive that a lot of boxed cookies. 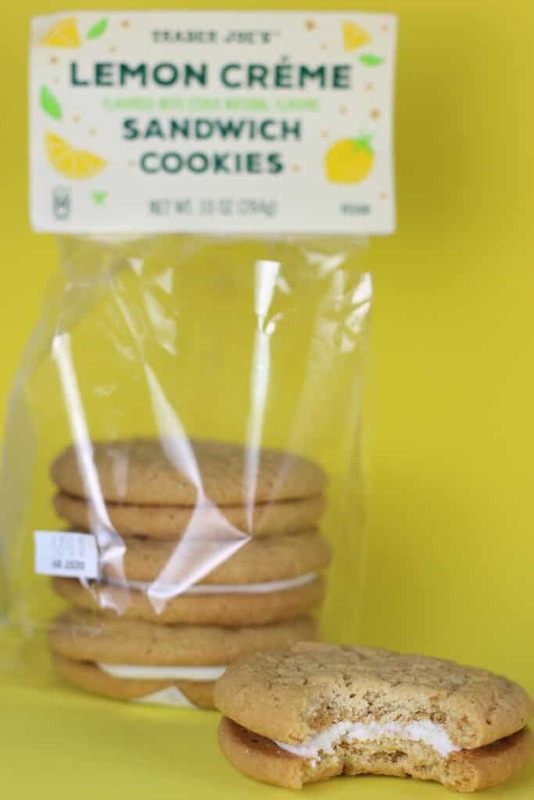 These are $4.29 for the four cookie sandwiches that you see in the bag. However, these are huge. How big? About the size of my palm. That wasn’t the only thing that struck me either. Each cookie sandwich is technically 2 servings. So you’ve been warned. Now the cashier told me that she had sampled them earlier in the weekend. The do arrive to the stores frozen. So staff had gotten to try some fresh and chilled cookies. She told me she liked the brownie ones better. So, I figured I would set the bar low and start with these. And honestly, they weren’t bad if you like a certain type of cookie. This cookie is not for you if you like a crisp crunch of a cookie. You’ll also be disappointed in this if you are expecting an in your face lemon flavor. It’s not here. If you like either one of those cookies then reach for Trader Joe’s Meyer Lemon Cookie Thins which are a boxed variety. Those were crisp and very lemony. These are chewy, thick cookies. They are on the soft side. But I found half a cookie to be satisfying. “Oh, they’re just like the ones you used to make.” I’ll take the compliment when I get them. Regardless, they are good. Not a must try item, but if you have a sweet tooth they are a good one to try. 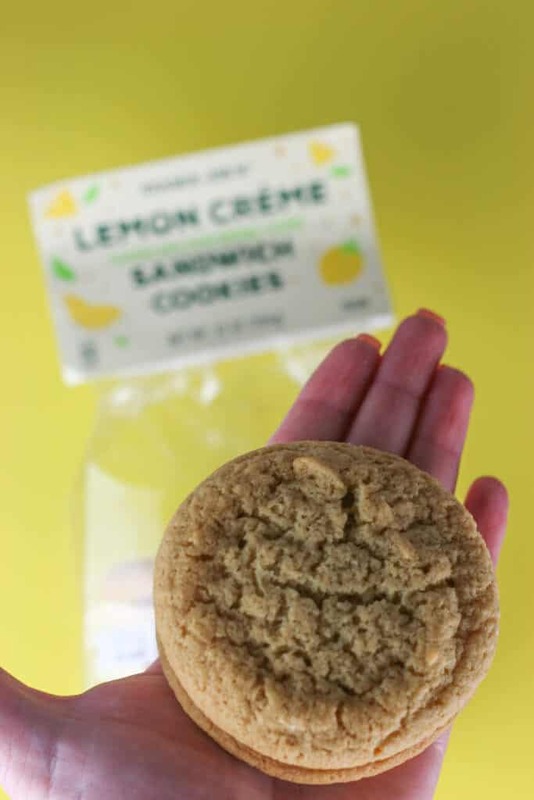 My husband approves of these, I was wishing for a bit more lemon flavor and a much smaller cookie (not words that come out of my mouth often). Otherwise, despite the slightly pricey cost per cookie, they weren’t bad. 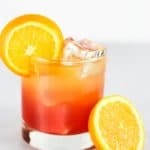 I enjoyed the one I had. Would I buy this again? I liked them, but my husband polished off everyone in the bag. They were a hit with him. 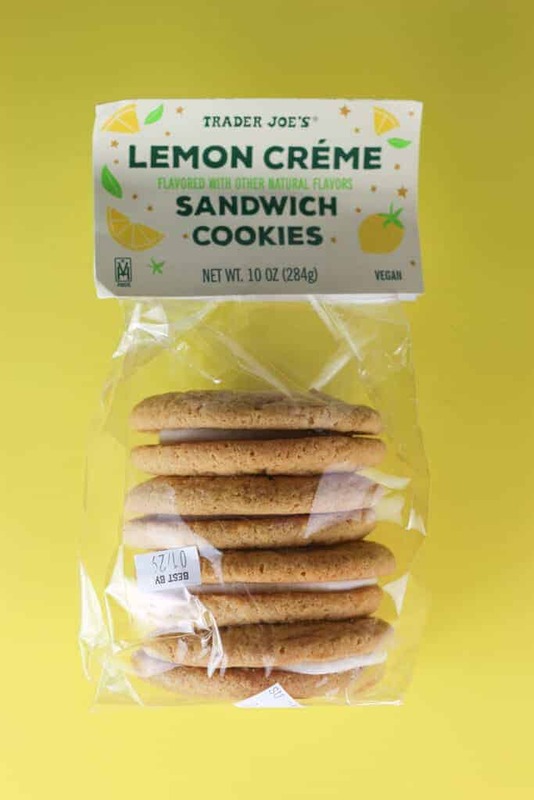 Trader Joe’s Lemon Creme Sandwich Cookies are new vegan cookies in the fresh bakery and bread aisle. 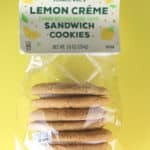 If you are a soft cookie fan you’ll love these. This is a nice lunchbox item for sure. Vegan and nut free! It’s rare to find a nut free cookie packaging. I could see this being used in ice cream or even garnish lemon meringue pies. Hey Alek! I agree. I’m always hesitant to name something nut free without it being listed on the ingredients. Some products mention it some don’t. It’s very confusing. Thanks again for stopping by! And they’re vegan!!!!! Yaaaaayyy!! 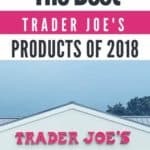 I’m on the lookout for the brownie ones- also vegan! 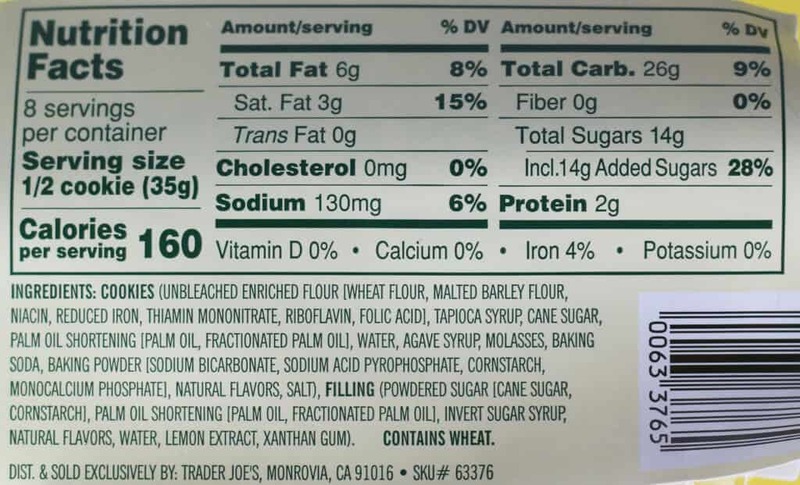 So lame that one cookie is two servings, why not just list info per cookie?? Hey Ttrockwood! They do mention per cookie, but these are really big cookies. It’s rare for me to say I struggled to eat just one, but they are that big and that filling. 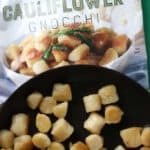 Can’t wait to hear if you try these! For $1.07 per cookie that is a big deal. Vegan and nut free too! WOW! 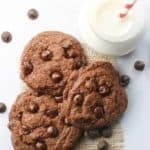 Perfect for dessert trays and can serve with the allergen free snickerdoodles too if nobody doesn’t have wheat allergen. 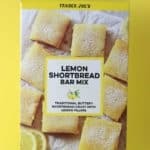 I just happened to see these at TJ’s yesterday and as I love anything lemon, I grabbed them. I didn’t even realize they were vegan. I absolutely loved them! I ate a whole one straight off the bat. They were delish. 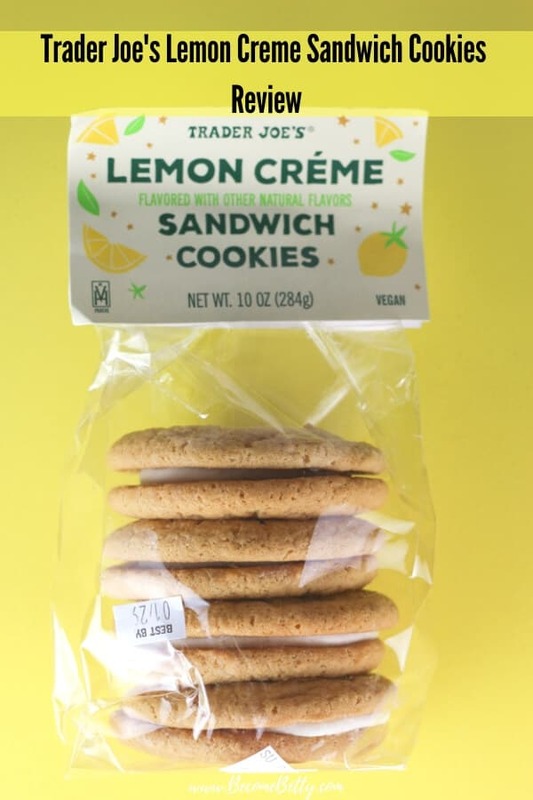 They could be more lemony but the flavor is definitely there. I’m already trying to figure out how I can replicate them in my own kitchen. The cookies themselves were almost too firm – could’ve been a little more tender. But I would not hesitate to buy them again. Hey Kathleen! 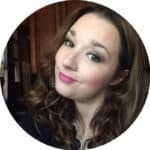 Thanks so much for sharing your thoughts on this!